But that was 6 years ago. To this day, I’m shocked by the number of producers, directors and editors who approach me at conferences or after a class who still refer to Final Cut Pro X as though it’s the same software launched back in 2011. At the time of this writing, Wikipedia has highlighted 23 updates since its official release. (At the rate technology is changing, I wouldn’t be surprised if another one were made while you read this article). Regardless, Final Cut Pro X has a robust number of features in it, and you might be surprised after giving it a second look. As production and post production professionals, we all develop workflows and patterns to which we perform tasks. Without these workflows, we could easily become disorganized on a project and lose our most valuable resource—time. Now imagine being presented with what promised to be a new professional tool to make your job easier but that looked radically different from anything you’ve ever worked with. As you started to use it, nothing seemed familiar. There were different names for common tasks and the “glue” that kept your project together vanished before your very eyes. Oscar-winning editor and sound designer Walter Murch shared his disappointments with FCP X at a Boston SuperMeet in October 2011. I believe this is how many video editors initially saw FCP X. The workflows and terminology with which they had become comfortable, no longer existed; and key features were gone forever or still had to be built into the application. This was enough for people to turn their backs on the software and never look back. But as I taught Final Cut Pro more over the first few years and saw how new video editors intuitively interacted with it, I started to open up to it more and more. Some of its features became second nature when I worked with it. My disappointments became less as Apple continued to listen to users and update its software. Also, the app ecosystem continued to grow. As an Apple and Adobe instructor, I’ve delivered over 30 certified classes in FCP X. Through my own personal experience, I’ve noticed that it’s faster to teach the FCP X curriculum then it was Final Cut Pro 7 to someone brand new to video editing. People in the class were able to start importing and editing very quickly. However, if I was teaching someone FCP X who had prior video editing experience, the time would take double. Over time it got me thinking, maybe what Apple intended to create from the beginning was something to make our lives easier and our jobs more efficient. Yes, it was released too early at first, but maybe part of people’s own resistance to change got in the way of discovering some really cool features that existed. So as we go on this journey together, I ask you to keep an open mind. Let’s get into some of my favorite features which I believe make FCP X one of the most versatile and powerful NLEs. An Avid Media Composer “Bin” of RED clips. However, the problem with bins is that they’re based on the idea of living in a physical world—you can only place a film reel in one bin, right? Unless you copied your footage to another reel, which might take a while. Today, we’re living in a digital age, and with it is the expansion of possibilities. A clip doesn’t need to live in just one location. When you search for a video on YouTube, what might bring you there is a series of keywords associated with the video—multiple words that all link to the same video reference. Since its inception, Final Cut Pro X has employed this into its workflow. You import a clip into your Event Browser, select it or a series of clips, then click a little icon that looks like a key. The keyword editor opens and inside it you can assign your clip(s) with a series of keywords. Let’s say your shot is a sunset of the New York skyline. You can quickly add the keywords “Sunset, New York, Skyline, Golden Hour” and after pressing enter you’ve now got a clip existing in 4 keyword collections. So when your assistant editor comes along the next day, they can search any of these keywords and have a much better chance of finding the clip. But wait, it gets better. What if you only want to apply a keyword to a segment of a clip? In the below image, you’ll see a clip of a fictional Johnny Cash recording a song in studio. In the Event Browser, a range selection (in and out points) have been made over one of the best parts. The keyword collection icon has been pressed and all the keywords applicable to the shot are applied. After pressing enter, if you look in any of the keyword collections created, only the portion of the clip selected appears. And then there’s also Metadata—all that data that gets recorded the minute you press RECORD on your video camera can be used in FCP X to create Smart Collections. Smart Collections are created the minute you import material into the application. All the video, audio and stills you import in your Library are automatically placed in these designated collections. It’s like having an assistant editor that organizes for you. Default Smart Collections in all Libraries. You can push Smart Collections even further by creating your own. By clicking on the Filter HUD icon next to your search field in the Browser, you can search for clips based on metadata and then create smart collections based on them. The Filter HUD where you can search for clips based on metadata. In the below example, I added a filter to isolate the clips in my Library that are 23.98 frames per second. On the bottom right side, I can create a new Smart Collection based on this. You can create Smart Collections based on a wide variety of parameters. You can even add your own metadata to several clips at once in FCP X. For example, if you work on a multi-camera project, you can identify several clips to be from the same camera by giving them the same name or angle. This can be done by selecting the appropriate clips in the Browser and from the Inspector, changing your Metadata View to General, and putting a name in the Camera Name or Angle fields. Selecting a Preset Metadata View to reveal Camera Angle and Camera Name fields. That information can then be used to help you create a multi-camera clip and have clips from the same camera grouped together rather then appear as separate. Finally, you can also apply custom names to clips and even batch rename several clips in FCP X to potentially help your workflow versus the generic clip names assigned by the camera. While Final Cut Pro X ships with several effects and transitions, it also contains several title and motion graphic templates. If you want, you can always create your own titles from scratch, but who doesn’t love a library of free stuff? Here are two free tips for some templates you might want to look at. Custom Text: This is an incredibly powerful feature which gives you a variety of possibilities. This title has a built-in character-by-character animator and the best part is you don’t need keyframes to get animation. You can find the custom title under the Build In/Build Out category. If you’ve ever used Motion, you’ll know you can achieve animation based on behaviors. Rather than add manual keyframes (which you can do), behaviors allow you to animate layers/clips by simply controlling sliders. To see the properties of Custom Text, drag it to your timeline and select it. In the Inspector, reveal the Title Properties. You’ll see a list of published parameters. Published Custom Text parameters in the inspector. These parameters are divided into 2 categories—in and out. “In” refers to how the text animates in and “out” is how it leaves. In the below example, I dragged the “In” opacity of the text to 0 and over a duration of 40 frames, the text animates in, character by character. Changing Custom Texts In Opacity for animation. The maximum duration for in and out animations is 60 frames, but you can change the animation style to animate the entire word or even line of text. Metal Textures: Under Generators is the Textures category, and one of the pre-installed textures is called “Metal.” By default it shows one image. Textures in the Generator Category. Drag it to the timeline, select it and reveal the generator’s published parameters in the Inspector. You’ll see there are 11 metal textures to choose from. These can be used as backgrounds, combined as effects, or applied as textures to text using blend modes or Knock Out text. Textures available from the Metal Texture. The saying “There’s an App for that” is equally true of FCP X. Its ecosystem of third-party plugins is vast and has been used in broadcast and feature films alike. First off, you’ve got Apple’s complementary apps of Motion and Compressor that vastly expand Final Cut’s capabilities for both motion graphics and exporting. You’ve got plugins for tracking from companies such as Core Melt; expanding 3D with MObject from Motion VFX; and a library of additional effects and transitions from providers such as Boris FX, Red Giant and FxFactory. For more information, Apple has a great resource page here. I would be remiss not to mention FCP X’s integration with Frame.io. Drag and drop clips onto your timeline and you can publish directly from within FCP X to Frame.io. It’s great for reviewing dailies or works in progress. You can even range-select and area to upload just specified section of your edit. Final Cut Pro X has lots of creativity under its hood. It was re-engineered to support the demands of modern day workflows along with the ability to take better advantage of a modern day computers resources. While the app was once quoted as being a glorified iMovie Pro rather than a professional video editor, I would say there’s an incredible amount of control and versatility that make the app unique and which often go overlooked. Some of its creativity is listed above, but I thought I’d mention some of those little things that keep me smiling when I work in it. Under the Browser’s Clip Appearance menu, you can enable continuous playback. Enabling continuous playback in the Browser. This allows you to continue watching each of the clips in the Browser. You could organize your clips in a particular order and then sit back without having to start and stop playback on each clip individually. I love the idea of editing in a timeline and not having to worry about where the playhead is. The append edit is the answer. This edit looks at the last clip in your timeline and then adds your selected browser clip(s) after it. Just press E or click the append edit button. If you’ve taken the time to organize your clips with great naming conventions, and created keyword and smart collections, then the Timeline Index will be the best assistant you’ve ever had. You can reveal the index by pressing the index button and search for clips in the timeline based on any of the above info. You can isolate your search to video, audio or tiles only. You can even add markers or assign roles to your media to expand the searching functionality. In the example below, I simply selected a clip in the timeline index and immediately my playhead moved to its in-point. In the timeline, you can duplicate the same clip or put various clips in a container called an Audition. The idea is to test them out to find which one is best. Personally, I use auditions to compare different voice-over takes and also see clips with various effects and color treatments. The best part about this is with the use of keyboard shortcuts you can cycle through the clips in your audition while playing back without stopping in your timeline. Looking at clips contained within an Audition. The changes to Final Cut Pro have been so divisive and the debate so provocative, a documentary has been made about it—Off the Tracks. It features interviews with many of the top educators and influencers in the Final Cut Pro X world, as well as movie industry professionals (i.e. Larry Jordan, Steve Martin, Mark Spencer, Chris Fenwick, Peter Wiggins, and even the original creator of Final Cut Pro, famed programmer and former Apple Chief Software Architect for video applications, Randy Ubillos). Since there have been so many updates since Apple’s initial response, I’ve re-answered some of the most frequently asked questions and concerns, highlighting all of the features now built in as of 10.3.4. Yes. The list of cameras and formats supported by FCP X has grown significantly. Can I edit my tape-based workflow? Yes, but it doesn’t offer the same support that FCP 7 did. You can integrate hardware from other providers to handle this if needed. In my opinion, looking back at Apple’s decision to not offer full support seems completely understandable when looking at the way video recording has gone to entirely tapeless based workflows. You can also see this adoption to tapeless in other NLE’s as well. Of course. Final Cut Pro X’s multi-camera editor is incredible and has been praised by many professionals as one of the best. One of my favorite features is the ability to give your clips camera names with metadata. Not only does this allow you to organize clips, but when you open up the multicam, clips from the same angle would be grouped together on just one camera angle. There are 2 clips on angle 5 with a gap clip in the middle. This is because they were identified as coming from the same angle using the inspector. Audio then synced all clips together. Yes. FCP X supports NTSC/PAL, HD and 4K monitors. For NTSC/Pal monitors, you’ll need a third-party interface hardware and software solution. 4K also requires third-party support unless you have a Mac that’s 4K capable and has an HDMI output. Firewire DV devices are not supported. My favorite part about the secondary monitor is your ability to not only show your viewers, but you can also to expand your Final Cut Pro workspace. This means that you can have your viewers stay on the primary monitor but then have your timeline or browser appear on the secondary display. In FCP7 and prior versions, a “project” was the file in which you did all of your work. You could duplicate it, back it up, or save it as another project. It was no different than any other file for a program. That all changed in FCP X. In the current version, what was once considered a “project” file, is now the Library. Within the Library are Events. Events are where your media is contained. Projects are now the equivalent of “timelines” from the previous versions of Final Cut Pro. Yes! There are a lot of them. The number of third-party plugins for FCP X is huge and growing. (See “App Ecosystem” above.) Also check out Lynda.com later this year. I’ll have a course featuring various plugins. Yes. FCP X refers to scratch disks as storage locations. You can modify the locations where a Library stores media by modifying its settings in the Inspector window. You can read some of the options here in Apple’s white paper on media management. You can also check out some third-party tools for asset management and collaboration. Yes and No. This needs a backstory. When Final Cut Pro X initially came out, clips and Projects (sequences) were placed in Events and stored in your Mac OS’s Movies folder. This frustrated FCP 7 users because every event that was in the movies folder showed in FCP X. It was like having 20 FCP 7 projects opened at once and you couldn’t close them from within Final Cut Pro. To hide them, you had to drag events out of your movies folder on your MAC OS and Final Cut would no longer see them. However, if you have more than one Event in a Library you are working on, there is no way to “hide” it. You can close and collapse the Event so as not to see all the folders and Keyword collections. Does Final Cut Pro X support AAF, OMF, and EDLs? FCP X does not export OMFs or AAFs. However, you could use a third-party plugin like X2Pro for AAF export, however. OMF: No, AAF is an option though. You also might want to tell your sound editor to update his software. Here’s a brief description of the differences between AAF and OMF. EDL: Apple decided not to support EDL export in FCP X (most likely because EDLs only support a single track of video). However, XMiL Workflow Tools has created EDL-X, an app that allows to create EDLs from FCP X XML files. FCP X is a trackless system (i.e audio and videos are not placed on tracks, but instead “float” freely above or below the main timeline.) This was one of the more frustrating changes for veteran FCP 7 users. However, FCP X uses “Roles” as a way of distinguishing different types of audio within a project. You can have roles for music, dialog, SFX, etc. You can export roles in a combined, multitrack QuickTime file or as separate audio or video files. During the export process you can assign mono, stereo, or surround output for your audio channels. Roles are the perfect way to export Stems for broadcast requirements. Yes. You’ve got some customization by going to File > Share > Add Destination. You can select a preset destination icon and drag it to the left. With it selected, you can tweak its available parameters. If you want more customization (ie: Watermarks, Timecode overlays), Compressor is the way to go. It’s $49.99 in the App store. Once installed, it will open up the amount of customization you can do, as well as add additional export formats for video and audio. As an educator, I hope that some of the misconceptions caused from Final Cut Pro X’s past become distant memories. There is so much more I could have written about. For instance, the “infamous” Magnetic Timeline probably deserves its own separate article. Once mastered, it can significantlyy increase the speed at which you edit. FCP X is a powerful and professional tool used on feature films, broadcast television, and corporate commercials. This article only scratches the surface of its capabilities. If you passed on checking out FCP X in the past, it’s definitely worth a second look. 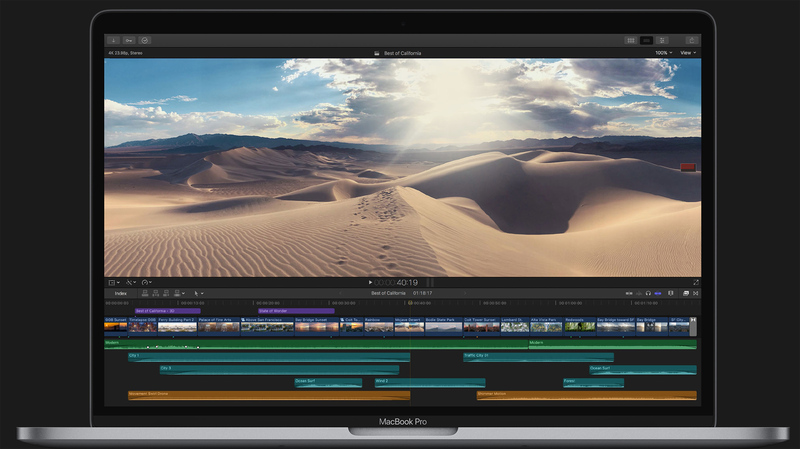 FCPX 10.4 was released subsequent to the publishing of thi article. Take a look at even more reasons it’s time to give FCPX a second look: color grading! Thank you to Nick Harauz for contributing this article. Nick Harauz is an Apple and Adobe Certified Trainer. He has an uncanny ability to engage his students and create a level of relatedness that keeps them coming back for more. Since 2002, Nick also works with domestic and international brands offering video production and motion graphic services. He has worked with clients such as Proctor and Gamble and Virgin Mobile. You can find some of his online training for Final Cut Pro X on Lynda where he has a weekly series with fellow training expert Jeff Greenberg.